Isabel Pagan (ca. 1741-1821) was a Scottish alehouse owner famed for a lovely singing voice and a wicked sense of humor. Her alehouse was a rowdy one; her guests would listen as she performed songs, rhymes, and skits, and her penchant for drunkenness never stopped her from entertaining. When she was in her sixties, she published A Collection of Songs and Poems on Several Occasions, from which these texts are taken. 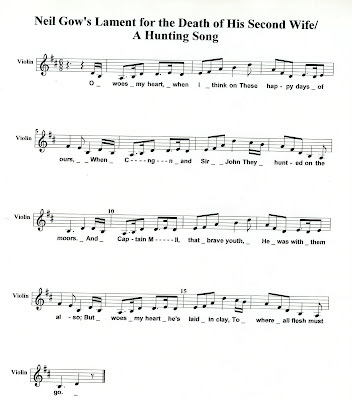 A New Song: "The French is in force now..."
A New Song: "To end youthful sporting..."
A New Song: "There came a bold hero..."
Song: "The Duke of Gordon's fencibles..."
There are numerous songs in Pagan's collection that have the name of a tune below their title. This project aims to recover those tunes and place them alongside Pagan's work, which was not meant to be silently read off of a page. When MIDI files and musical scores--both with just the skeleton of the melody for these tunes-- accompany Pagan's "poems," they can be read with a slightly better understanding of how the original audience experienced them. They hunted on the moors. To where all flesh must go. Scarce ever bore a gun. Kind hearts would cease to mourn. That have no right to shoot. Although they were not scant. Three times he brake his gun. It makes my heart full sore. Who caus'd me drink their health. And hearty on the hill. That had as free a heart. And I'll repeat these lines to them, How W -- a brake his gun.